Pressure is mounting against Hikvision, Dahua, and other companies operating in Xinjiang as an international outcry brews against the Chinese government’s campaign of mass detentions and surveillance in the region. Taken as a whole, the various moves spell serious trouble for any company making money off Xinjiang’s booming security sector in the form of sanctions, boycotts, and activist campaigns. The Trump administration is currently considering sanctions against Hikvision and Dahua due to their activities in Xinjiang; if passed, these could end all their US activities and threaten their global supply chains. (Trump Administration Considering Sanctions Against Dahua and Hikvision). The toughness of the sanctions reflects the seriousness of the situation in Xinjiang, where China is accused of detaining up to one million Muslim civilians, chiefly members of the Uyghur minority, and building up a “21st century police state” thanks to advanced surveillance technology. Hikvision and Dahua are deeply involved in Xinjiang. IPVM revealed the firms have won $1.2 billion dollars in huge surveillance projects there since 2016. Two of those projects, both won by Hikvision, mandate advanced camera systems for re-education camps and hundreds of mosques. A bipartisan group of US lawmakers led by Senator Marco Rubio (R-FL) introduced a bill called the Uyghur Human Rights Act on November 14, 2018. The drafting of a US government report which lists "all Chinese companies involved in the construction or operation of the ‘political education’ camps, or the provision or operation of surveillance technology or operations, across Xinjiang." “United States companies and individuals selling goods or services or otherwise operating in Xinjiang should take steps, including in any public or financial filings, to publicly assert that their commercial activities are not contributing to human rights violations in Xinjiang or elsewhere in China"
If passed, this bill could eventually lead to sanctions against Hikvision and Dahua by highlighting their role building up Xinjiang’s system of surveillance and detention. Recall that both the Treasury and Commerce departments are already considering Xinjiang-related sanctions on Hikvision and Dahua. An official US government report detailing their role in Xinjiang could pave the way for a sanctions announcement, which come with no warning and are impossible to appeal. 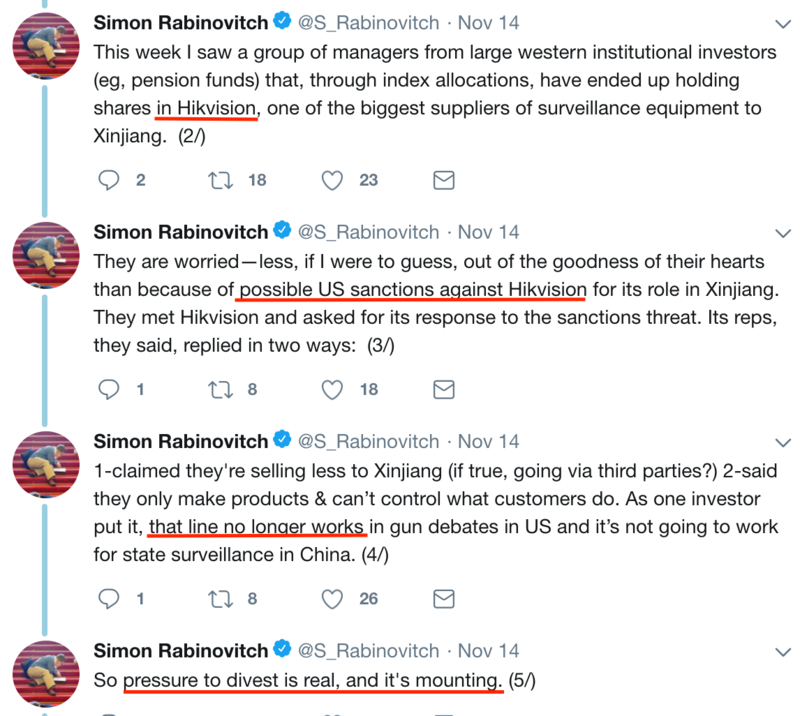 On Thursday, Rabinovitch tweeted that he met a “group of managers from large Western institutional investors” which own Hikvision shares through index funds. Rabinovitch said the investors were “worried” because of “possible US sanctions against Hikvision for its role in Xinjiang” and met with the company. Hikvision's claim that it is only selling cameras in Xinjiang is false. Hikvision is deeply involved in designing, building, and even operating the Xinjiang projects it has won. For example, the bidding contract for Hikvision's $53 million facial recognition project in Pishan county - which includes surveillance for mosques and a re-education camp - will see Hikvision "design-finance-build-operate" the project for 21 years before turning it over fully to Chinese authorities. Western investors including JPMorgan, Fidelity, Vanguard, and Deutsche Bank have all reported holding Hikvision shares in their portfolios this year. Hikvision is a popular stock with foreign investors, particularly after it was included in the widely-followed MSCI Emerging Market Index. This is a reference to the Treasury Department sanctions IPVM previously covered. “As a starting point, purportedly responsible companies should voluntarily agree not to purchase or invest in such technology or collaborate with the surveillance companies clearly implicated in the Xinjiang violations," she wrote. The Uyghur World Congress, an organization of Uyghur exiles based in Germany, issued a press release calling for an “immediate closure of internment camps”. Impose sanctions on Chinese and international companies complicit in this Crime, including the equipment and technology used in the detention centers and the total-surveillance apparatus throughout the Uyghur Region. The US-China Economic and Security Review Commission (USCC), has called out the use of technology in Xinjiang in its annual report to Congress. The USCC is a congressional commission that advises the US Congress on China. In its report, the USCC said that “cutting-edge technology enables the Chinese government’s repression campaign” in Xinjiang. Overall, the report indicated a toughening attitude from the US towards China. "A consensus has emerged that the U.S. must pursue a more robust approach to protect its economic and security interests in view of Xi Jinping and China’s hostility to economic and political liberalization,” USCC Chairman Robin Cleveland said. 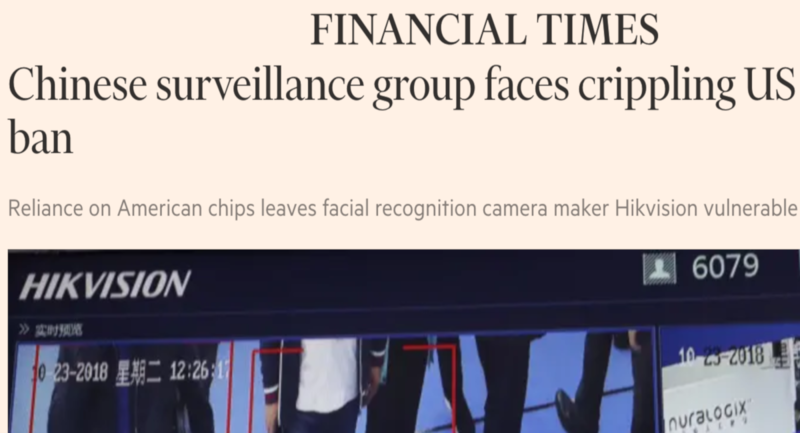 The threat of Xinjiang-related sanctions on Hikvision was the focus of a recent report from the Financial Times, the UK's leading business newspaper. The FT article was skeptical of Hikvision's ability to source advanced components domestically, noting that "the gap between Chinese capabilities in CPU and GPU design and manufacture has allowed foreign suppliers to remain dominant". The FT ended its article by saying that the Chinese government is now a liability for Hikvision. "State support — once a guarantor of commercial success — has now become a stumbling block for the ambitious surveillance company." All these separate developments show that corporations involved in Xinjiang are already facing calls for sanctions, boycotts, and divestment, along with the unwanted media attention that results from such initiatives. With the Chinese government denying any issues in Xinjiang, such pressure is only likely to increase.